You hear all kinds of stories about what to expect from a dog when a new baby comes into the family. 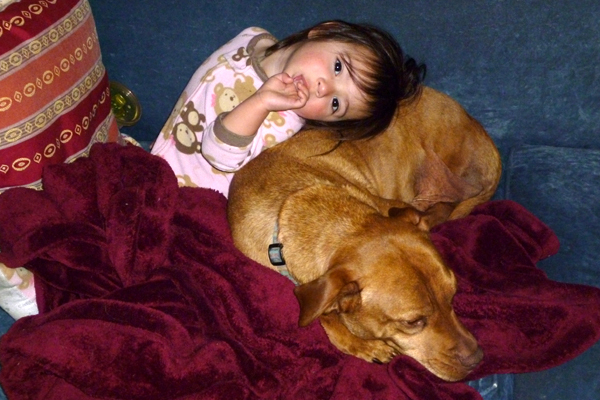 My pit bull mix Finley has always loved kids (and I do mean love), but I wasn’t sure what would happen actually having one in the house. I know that historically pit bulls were family pets that often spent most of their time with the children of the family, like a nursemaid. But I still wasn’t sure what to expect. Finley has always been my baby since the day I brought him home when he was about 9 months old. He is now almost 6 years old and is my 35-pound lap puppy! He also spends quite a bit of his life visiting schools and helping kids (about 7,000 per year!) to learn about a lot of different things, including kindness, adaptations and pet care responsibility. You can imagine then how happy I was when Finley adopted my daughter Kaelin as his own (we often refer to Kaelin as his baby). He was constantly checking on her and much to her chagrin, licking her. Whenever Kaelin would make a noise in her crib or cry when she awoke, Finley would run into the bedroom and stick his nose between the slats to check in on her. As Kaelin has grown, this relationship has remained the same. When she wakes from a nap, he runs to the bedroom door and waits to go in to see her and check on her. 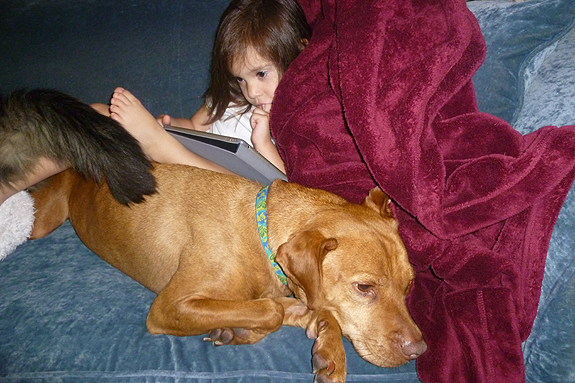 He follows her around, and at times they seem like characters from one of those old television shows from the ’60s, like “Gentle Ben” or “Flipper.” He lets her sit on him, and he snuggles next to her on the couch any chance he gets. His love and attention toward Kaelin has far surpassed any expectation that I could have had, and like I love and care for him, he has shown that love and care for my baby girl, something that continues to amaze me. 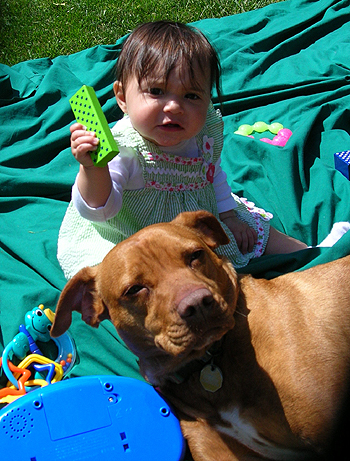 Pit bulls are called “nanny dogs” for a reason. Both your babies are adorable! If I were you, I’d watch that Pit Bull! He may lick & love your baby girl to death!!!!! LOL! 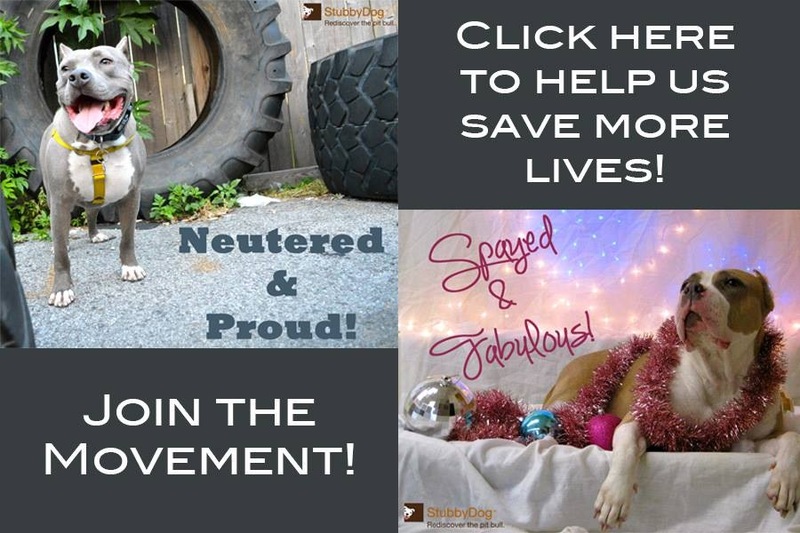 Seriously, though, another feel good story about Pibbles!! Way to go, Finley!!! @StellaGVidales Isn’t this just the sweetest story. We love the photos too! Thanks Stella. This is heartwarming. Finley is a beautiful dog!